The notion of real time star wars, possibly with nukes and/or other super-weapons, should terrify everyone. The 1967 Outer Space Treaty bans nations from placing WMDs (not conventional weapons) in earth orbit or otherwise in outer space. It restricts use of celestial bodies to peaceful purposes, bans space bases and outer space weapons testing. The 1963 Limited Test Ban Treaty prohibits nuclear testing in outer space. The 1972 SALT I Treaty, 1987 INF Treaty (pulled out from by Trump), 1992 Conventional Armed Forces in Europe Treaty, 1994 START I Treaty, 2000 Start II, 2011 New START, and other international agreements include provisions dealing with space-related issues. The UN Conference on Disarmament, established in 1984 to negotiate arms control and disarmament agreements, strongly opposes weaponizing space. So do the vast majority of world nations. The cosmos should be used exclusively for peaceful purposes benefitting humanity. Washington refused to negotiate with Russia and China on their joint draft treaty to ban space-based weapons. “We need to clarify the essence and content of military strategy, the principles of prevention, preparation for war and its conduct” – a strategy for self-defense, not aggressive war, how the US, NATO, Israel, and their belligerent allies operate, not Moscow. 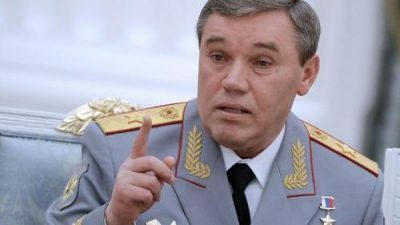 Russia must prepare for war by “classical” and “asymmetric” methods, Gerasimov explained, a strategy for strategic deterrence. “All the commanders of military districts, integrated combined arms forces, air force and air defense units, as well as 96% of the commanders of combined-arms units and formations, have combat experience” – from service in Syria combatting US-supported terrorists. “The share of modern weapons in our nuclear component has reached 82%,” Gerasimov explained. Russian hypersonic and other super-weapons exceed America’s best, developed and produced at a small fraction of what the US spends, countless trillions of dollars poured down a black hole of waste, fraud and abuse. Given US belligerence, its endless wars of aggression, its aim to dominate all other nations by brute force if other tactics fail, Russia “by all means (must) ensure technical, technological, and organizational superiority over any potential adversary,” said Gerasimov – meaning the US and NATO it controls, along with Israel. The above strategy was first used in Libya, currently being partially used in Syria. Venezuela is being targeted the same way – a low-level proxy offensive so far, likely to greatly escalate ahead, causing mass casualties and greater chaos and harm to millions of Venezuelans than already. “We must be ahead of the enemy in the development of military strategy, one step ahead,” ready to strike swiftly with overwhelming force if attacked. Post-WW II, the US never waged war on a nuclear power able to hit back as hard or harder than the Pentagon’s capability. Northeast and Southeast Asian wars, Balkan ones and others in the Middle East, Central Asia, and North Africa are entirely different from confronting militarily powerful Russia and/or China – even non-nuclear Iran able to respond with great force against adversaries if attacked. Yet Washington’s rage for dominance makes unthinkable wars possible, including with nukes able to kill us all if enough WMDs are detonated. His order was a first step toward creating a space force for real time star wars. The ominous possibility should terrify everyone.